This set looks pretty cool in a Undead warlock! This set comes from Ulduar 25, Abóbada de Arcavon 25, and Dalaran JP Vendors. Manoplas do Conquistador Imprevisível from Mimiron's chest. I want this set on my lock and thought it would look cool with a nice Scythe ... anyone have some ideas? How about the Cajado dos Pecados Justificados (A) / Cajado do Caminho da Sinistra (H) from Bênção para os fortes (A) / Prova de poder (H), the warlock class quest in Bastilha da Presa Negra? There are also Foice de Guerra that rest on your back upside-down compared to the class quest reward, which rests rightside-up. Or the Foice Gelada do Senhor Ahune from Ahune, which fits with the Northrend theme of the whole set (but you'll have to wait until next summer). This is the gear set being worn by Grand Apothecary Putress in the Wrathgate cinematic. For an extra bit of evil apothecary goodness, accept the quest Special Delivery for Brivelthwerp to get the I-Scream Cryocannon and then never turn it in/abandon it. You'll get to keep the big blue pump backpack even outside of the zone and go a long way towards making you look even more badass in this set. You can buy the helm and robe with JP from a vendor in Dalaran. So realistically the only thing you'll be farming for are the shoulders and gloves in 25 man Ulduar. To all you worgen warlocks out there: this is one of the few transmog sets where the head isn't ruined because of the shape of worgen heads! Ever since the 5.0 patch, warlocks and mages can no longer buy JP and VP gear with spirit on it, making it impossible to obtain Faixa dos Encantamentos Potentes. I made a ticket regarding this and awaiting a respone atm. I found a matching staff and a pair of boots that fit really well. 2h Staff: Ti'tahk, os Passos do Tempo Really fits well with this set in my opinion. Boots: Sapatilhas da Salvação da Forja Titânica, The purple color applies the finishing touch. OK, im going to save the hassel of doing raids. This will take you 30 mins to get the exact look. Head and breastplate, wayward conquer from the vendor with JP,Arcanist Firael. Braçadeiras Vilcórdias Felheart T1 bracers. BoE so look in the AH or farm MC. Legs/Feet..meh. They hidden. Don't bother imo. GrimReaper ! pwoar! (gets control of myself) I hope this guide takes away the pain. Excuse typos and wot not. Im dumb. Is there a shirt or something to cover the neck? The way it's so open doesn't appeal to me. Would I need to be a warlock to transmog this set of gear? Garrassábia, Presa da Mente, or Fendedor all look great with this set imo and are easy to acquire. If you can get it Tirso dos Rituais Revoltantes matches the ominous look very well. The Livro dos Mortos and it's other variants work quite well with this set. It adds to the "Dark Practitioner"/"Necromancer" feel. Thought I'd say that Mandíbula das Chamas de Fandral goes fairly well with this set, but that's just my opinion. In retrospect, several heroic Cata staffs could go pretty well with the set due to their purple coloring. I'm shocked that Cajado de Mistérios Infinitos hasn't been mentioned as an excellent match for this set. Finally, our Tier 8.5 is complete! P.D: In comparison of the original mmo-champ post. Magespada do Gladiador Atroz and Lâmina Enfeitiçada da Angústia look great. Staff, Cajado de Energia do Gladiador Atroz. Edit: Heroic Adaga do Resplendor Fulgurante is an awesome dagger for this set. A fantastic Staff transmog to use with this set is Grievous Gladiator's Energy Staff. It's the season 15 healing staff, so it's not terribly common to see it on a Warlock and the colors and the vulture skull fit together perfectly. For a cloak, I personally prefer a Rippling Flamewrath Drape that you can get from friendly reputation with Avengers of Hyjal in Firelands. Just kill a bunch of trash and you should hit friendly in no time. For a staff, I prefer Malevolência, which is a very stunning addition to the set, and very "warlocky". I find it interesting that this "birdlike" set is worn by the Grand Apothecary Society, those responsible for the plague dumped at the Wrathgate, because it bares a similar appearance to the garb of a 17th century plague doctor. Their masks were in the shape of "beaks" that were (impractically) meant to block the passage of miasmas into their bodies. They filled the beak with herbs and hay to help filter the "bad air" that they thought the plague was carried in. The helm for this set reminds me a lot of it, and thus, makes the transmog even better for an undead player, such as myself. Whether or not it's a coincidence that they chose this look for the set, it certainly makes for an interesting role playing experience! Shame there's no lookalike, because this doesn't fit warlocks in the slightest. Pro-tip: the sleeves end in a design that mimics the bottom of the robe, so find a dark pair of gloves that only covers your hands to expose them, looks much better. I -really- wish that the *exact* same shade of Fel-Green that Putress is wearing was obtainable...Then I'd have the perfect robes to go with Gul'Dan's shoulders! 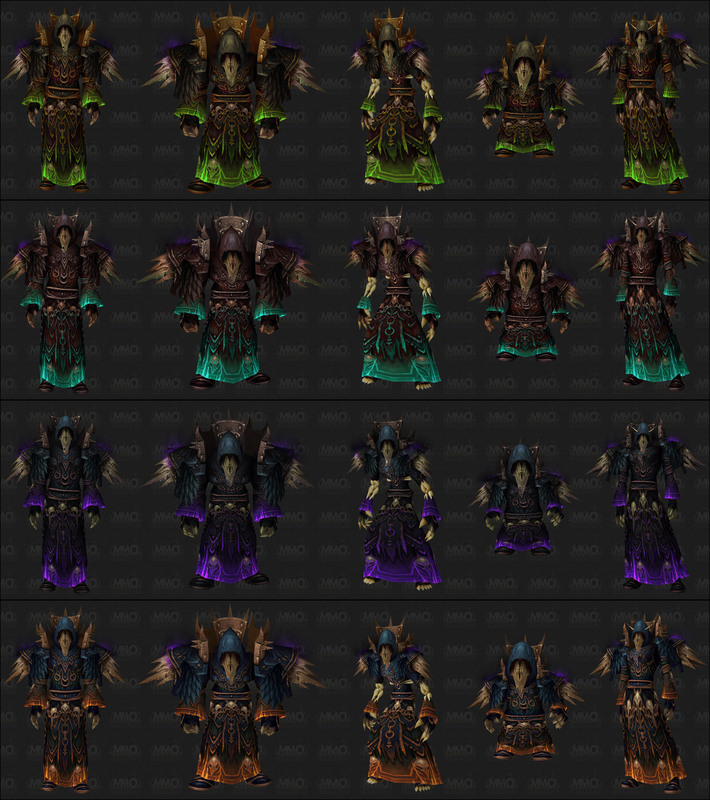 My outfit version of the Deathbringer Garb (Recolor) transmog set with some personal picks for shirt, cloak and staff. Sad that there's no non-token version of this set like there is for the priest and mage sets. It would be great for shadowpriests. Camisa Vermelha de Operário covers up the visible neck area perfectly, making the outfit seamless.